Pixel polyfill for "Root em" or rem font-size unit - detailed explanation with a handy SASS mixin. It is so common to see rem units over em and px nowadays in web design, which has been around since 2012. The rem unit is expanded as “Root em”. In case you don’t know how to use it, you should read this awesome article by Jonathan Snook. Unlike em, rem gives you the freedom to size things without depending on the font-size of the parent element. I’m not advocating rem here—in fact I’m using em in all my projects as yet, but still there are people who want things simplified with less calculations, which can only be possible with rem. Why not em or px? If you know the difference between px, em, and rem, you already know the answer to this why. Note: The major concerns in today’s web design is the accessibility and compatibility. These two things has made industry people think more than ever on what to choose and what not. Pixel or px unit allows you to size things independently without relying on the font-size of the parent element. If you go with the px, that will make things go rigid and unresponsive across different screen resolutions. Whereas em is relative to the current font-size of the browser window. If you go with the em, you make that responsiveness task more easier. But you have to do more math as the sizing with em completely depends on the font-size of the parent. Whereas rem only depends on the font-size of the root element, and not of the parent. This cuts that extra work of keeping in mind the font-size of the parent. As rem is a CSS3 addition, you don’t have it supported on all web browsers especially the older ones. So, using a fallback is certain to make things look good where it lacks the support. The hack is very simple. We have to declare the size property (font-size, width, height) in px first, and then re-declare the same properties with equivalent rem units. Browsers that lack rem support will read only the size in pixels, and will ignore the rem declaration. If your root element (<body> or <html>) uses a font-size of 100%, your base font-size in pixels is 16. Therefore, giving a property a value of 1rem, you would declare it of 16 pixels. Similarly, to declare a value of 10px, 0.625rem (=10/16) have to be given to the property. Further, you may set the font-size of root element as 62.5% that will make the base font-size of 10px; i.e. 1rem = 10px &dash; that would makes things pretty easy on the calculation side. 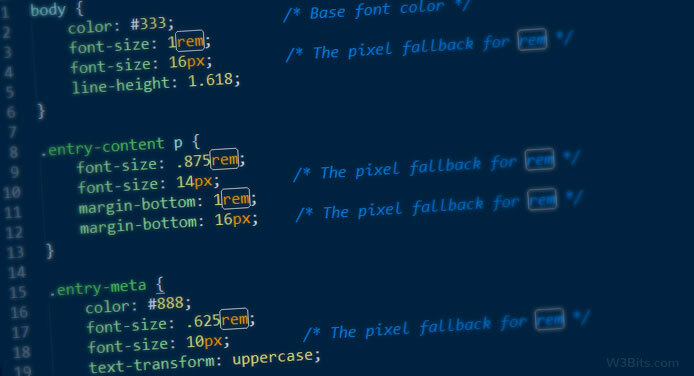 If you make extensive use of rem units in your projects, then having a SASS mixin for px fallback for rem is a must. That’s pretty much it. Hope you found this useful, thanks.